No big nominations, but space films "First Man" and "Solo" have a few tech-focused nods this Oscar season. 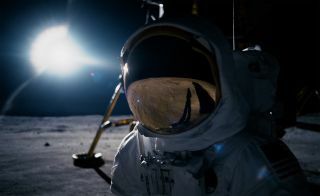 "First Man," directed by Damien Chazelle and starring Ryan Gosling, documented the early days of the Apollo program culminating in Neil Armstrong's historic trip to the moon. The movie folded in meticulously detailed Apollo-era technology and set pieces, and the effort was rewarded in technical nominations: the movie bagged nominations for production design and for set decoration, as well as for sound editing, sound mixing and visual effects, according to the Academy Awards website. Meanwhile, "Solo: A Star Wars Story" was nominated for a visual effects Oscar, as was "Avengers: Infinity War," which featured several long scenes in space. The 8-minute animated movie "One Small Step," by Taiko Studios, was nominated for best animated short film. The film follows a young girl who hopes to one day be an astronaut. Despite the lack of many space movie nominations, remember one more Oscar connection if you tune in Feb. 24: the gold-plated trophies are coated the same way as the ultra-reflective mirrors on NASA's upcoming James Webb Space Telescope!